Having hubby home makes for a great opportunity to tackle house projects I dream up. Honestly, I try not to even try doing big projects through the week. It just puts too much pressure on my family as I get so engrossed in a project, and then neglect to care for my family properly. (Poor kids and hubby!) It's happened before. And it really messes up our week. So I've settled to patiently waiting for my fun when hubby's home for those extra pair of (manly) hands to help! 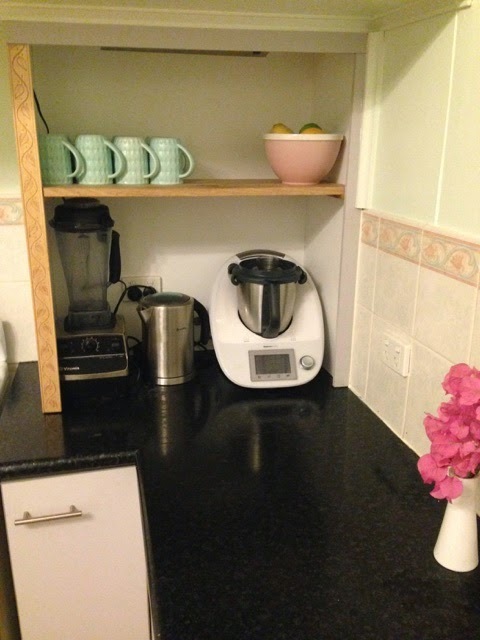 The last project I was excited to tackle was some renovations on my kitchen. 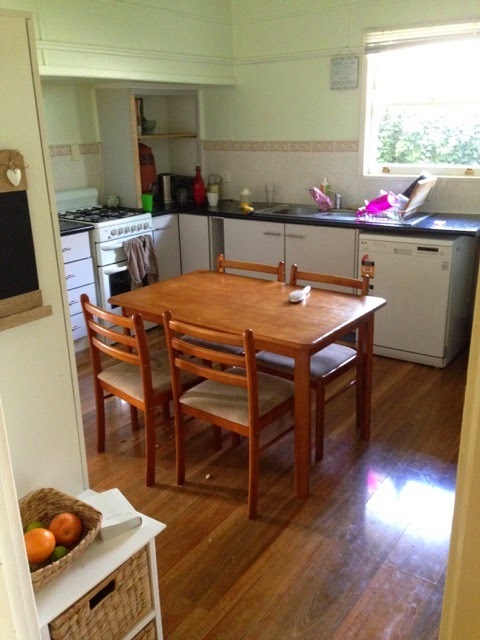 We're renting at the moment, so that eliminated the big change possibilities. Plus we're on a budget, I couldn't go on an all out renovation splurge. But I knew that our kitchen was running very inefficiently with things out of order and I was forever doing unnecessary cleaning (food covered chairs anyone!?). I stayed up late the night before 'my day' clicking away on Pinterest for ideas and designs and colours I liked and would go well in our current kitchen. Not something I do too often, and it was a lot of fun! 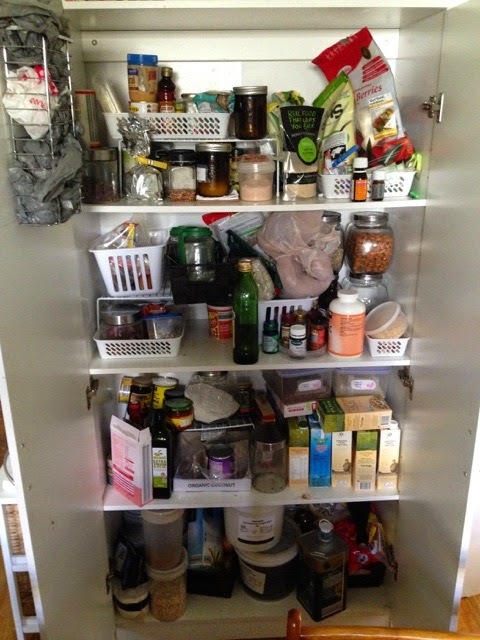 Oh, and my pantry was a terrible mess. I found it very stressful every time I tried to find something through the week while caring for my babies! 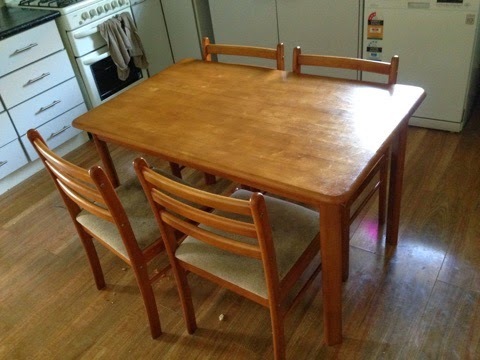 We've had this table for a long time, and now with two toddlers it's not the most practical for everyday use. With its cream material chair cushions and chair backs constantly having to be wiped down from food covered little hands. 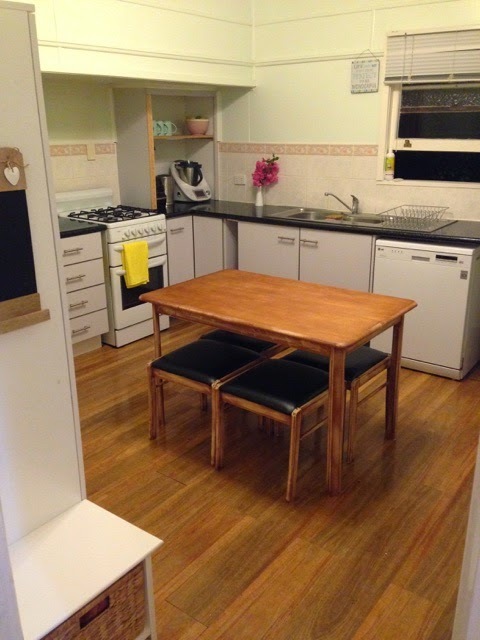 I hunted on gumtree for a new table or island bench. All too pricey or non-existent locally. And so, came up with this ingenious idea! My clever hubby chopped the backs off the chairs for me, and did all the hard work of sanding the chair bases and table back for a real rustic look. While I ducked to Spotlight and bought a good priced sturdy, waterproof material to re-cover the cushions. And for $30 odd - I LOVE the new look!!! It's like an island bench table with mini functional stools! My other splurges were a couple of bright tea towels, a couple of jars and a few herb jars, two new mixing bowls and a salad bowl that I LOVE and find it a pleasure to use. A new set of mugs and some sturdy drinking tumblers (no more broken glasses!). The rest was all hard work and organisation. 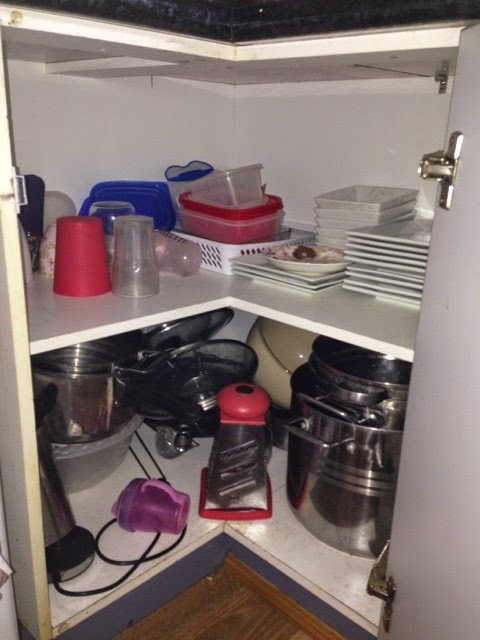 My organised cupboard. It's so much more functional. 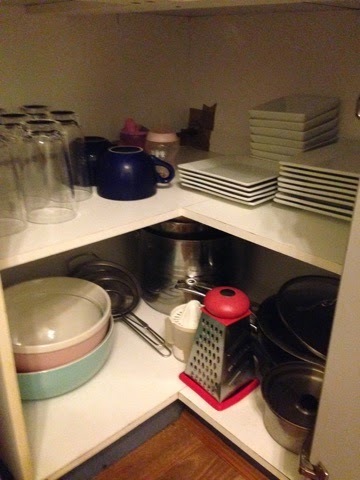 The plastics, culled down to mostly glass containers, moved to their own little sectioned area in the under-sink cupboard. I got rid of an old pot and pan and now just have two pans and three different sized pots. That works for us. It's so nice to work with things that we enjoy using. 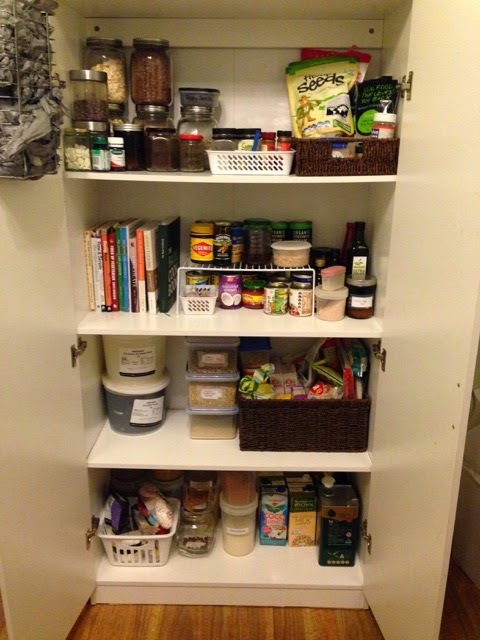 My pantry. I LOVE it now. I know where everything is. I got rid of any food that was out of date or that we don't eat and had been sitting there for a very long time. I also put some foods in jars instead of bags, much easier to use and find. And because everything has it's place and I've told our household members where everything goes, it's been a week and it still looks this tidy! I'm thrilled. Little things excite me these days ;). I've only kept out the appliances that I use daily. And voila, The end result! I love that I can wipe down the table and seat covers quickly without scrubbing, much more efficient. And everything having its own place makes keeping things tidy a lot easier. My kitchen still gets messy. But I've found that I enjoy cleaning it, it's satisfying keeping things you love nice. And on the days that I don't have time, that's okay too :-).